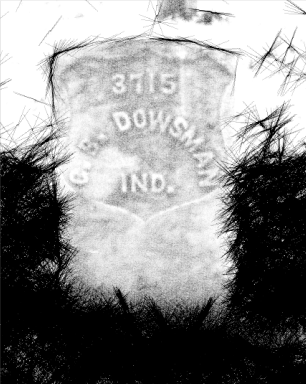 George was the son of Jacob Dausman (1820-1878) and Margaret A. Snyder (1820-18xx) of Concord, Elkhart County, Indiana. Jacob came to the United States from Germany in the late 1830s. The 75th Indiana Infantry left for Louisville on 21 August and then moved on to Lebanon, Ky. They participated in the pursuit of Gen. Braxton Bragg into Kentucky October 1–20. 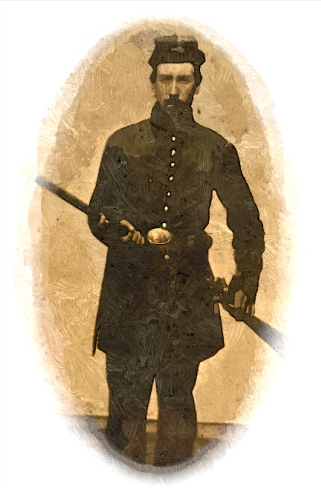 1862 and were engaged at the Battle of Perryville on 8 October 1862. From there they marched to Bowling Green, Ky., October 26-November 3, and then to Scottsville (November 10) and to Gallatin, Tennessee (November 25). They pursued Morgan to Glasgow, Kentucky from 22 December 1862 to 2 January 1863 and then moved to Cave City (January 2). From there they went to Nashville and Murfreesboro, Tennessee which was the end of the line for Pvt. Dausman. I have an opportunity to write to you and thought that I would. It is raining this morning and looks as though it would rain all day. There will be no drilling to do today and as I have no guard to stand, I will not have anything to do but stay in my tent and write letters if I want to. Then they will go to camp and not to Antioch. We have a jolly time here in camp but we do not expect quite as good times when we leave here and we expect to get orders to march every [day]. But if we do get orders to leave as soon as we expect to, we will not go farther than Indianapolis and there we will have better times than we have here. Our living is very good here. We have bread baked by the bakers, beef, crackers, and ham. Coffee, tea, sugar and molasses is dealt out regularly every morning. The Friends bring us in the nick backs such as money, pies, butter, pickles, and a great many other little things. And the hen roosts, cornfields, and potato patches in the vicinity of the camp furnish us a bountiful supply of such things as boys generally get when they break guard. Night before last I brought one of the biggest turkeys into the camp that ever gobbled. He made a good mess for our whole mess. We have to stand guard 8 hours in 24 when our turn comes, which is once about every 12 days. Besides that, we have to drill from 6 to 8 hours every day when the weather is good. We have not got our clothes yet and only drew our blankets last night. You can expect to hear from me soon again as I do not have much to do but to drill very frequently. ¹ Camp Wabash was located at the northwest corner of Chestnut & columbus Streets along the Wabash River in Wabash, Indiana. This entry was posted on Thursday, October 16th, 2014 at 1:59 am	and posted in Uncategorized. You can follow any responses to this entry through the RSS 2.0 feed.